1. William Morris, “The Depression of Trade,” in The Unpublished Lectures of William Morris (Detroit: Wayne State University Press, 1969), 123. 2.有關歐洲主權債務危機詳見Costas Lapavitsas, Profiting Without Producing: How Finance Exploits Us All (London: Verso, 2013), 288–300. 3. Lawrence Summers, Speech to the IMF Fourteenth Annual Research Conference , November 8, 2013, http://larrysummers.com; Alvin H. Hansen, Full Recovery or Stagnation? (New York: WW Norton, 1938), 289; and “The Stagnation Thesis,” in American Economic Association, ed., Readings in Fiscal Policy (Homewood, IL: Richard D. Irwin, 1955), 540–57. See also John Bellamy Foster, “What Is Stagnation?” in Robert Cherry , et. al., The Imperiled Economy: Macroeconomics from a Left Perspective (New York: Union for Radical Political Economics, 1987), 59–70. On the origins of the stagnation debate in the 1930s see William E. Stoneman, A History of the Economic Analysis of the Great Depression (New York: Garland, 1979). 4. Lawrence Summers, “ Why Stagnation Might Prove to be the New Normal ,” Financial Times , December 5, 2013, http://ft.com. 5. Paul Krugman, “ Secular Stagnation, Coalmines, Bubbles, and Larry Summers,” New York Times blog (November 16, 2013), http://krugman.blogs.nytimes.com. 9. Paul M. Sweezy, “ The Crisis of American Capitalism ,” Monthly Review 32, no. 5 (October 1980): 2–3. 10. Sweezy, “The Crisis of American Capitalism,” 3. 11. See John Bellamy Foster and Henryk Szlajfer, eds., The Faltering Economy : The Problem of Accumulation Under Monopoly Capitalism (New York: Monthly Review Press, 1984). 12. Hansen, “The Stagnation Thesis,” 551–52; Paul M. Sweezy, Four Lectures on Marxism (New York: Monthly Review Press, 1981), 36–39. 13. Sweezy, “The Crisis of US Capitalism,” 4–6; Paul M. Sweezy, “Why Stagnation?,” Monthly Review 34, no. 2 (June 1982): 7. 14. Paul A. Baran and Paul M. Sweezy, Monopoly Capital (New York: Monthly Review Press, 1966), 139–41. 15. Sweezy, “The Crisis of American Capitalism,” 6–7; Alan Greenspan, “The Great Malaise,” Challenge 23, no. 1 (March-April 1980): 37–40. 16. Paul M. Sweezy, “ More (or Less) on Globalization ,” Monthly Review 49, no. 4 (September 1997): 3. 18. Harry Magdoff and Paul M. Sweezy, “ Production and Finance ,” Monthly Review 35, no. 1 (May 1983): 1–11. 19. Magdoff and Sweezy, “ Production and Finance ,” 11.財富效應這個概念——或者用馬格多夫和斯威齊書中的說法，是伴隨著財富增加的消費減少（以資產價值衡量）——在解釋實際金融泡沫對GDP增長的影響、特別是解釋近年來基於房產財富效應的房產泡沫時，發揮了重要的作用。見Dean Baker, The End of Loser Liberalism (Washington, DC: Center for Economic and Policy Research, 2009), 18; Christopher D. Carroll and Xia Zhou, “Measuring Wealth Effects Using US State Data ,” paper presented at Federal Reserve Board of San Francisco Conference on Empirical Macroeconomics Using Geographical Data, March 18, 2011, http://frbsf.org. 20. John Bellamy Foster and Fred Magdoff, The Great Financial Crisis (New York: Monthly Review Press, 2009), 121–22. 21. Harry Magdoff and Paul M. Sweezy, Stagnation and the Financial Explosion (New York: Monthly Review Press, 1987). 23. Harry Magdoff and Paul M. Sweezy, The Irreversible Crisis (New York: Monthly Review Press, 1988), 76.類似的觀點激進轉變出現在海曼•明斯基對1987年股災的回應中，這種觀點轉變使他引入了“貨幣經理資本主義”（money manager capitalism）的概念，將之作為體系發展的一個新的危險階段。見Hyman P. Minsky, “Financial Crisis and the Evolution of Capitalism: The Crash of '87—What Does it Mean?,” in Mark Gottdiener and Nicos Komninos, eds. Capitalist Development and Crisis Theory (London: Macmillan, 1989): 391–403. 24. See John Bellamy Foster and Robert W. McChesney, The Endless Crisis (New York: Monthly Review Press, 2012), 4. 25. Jared Bernstein, “ Structural Stagnation, Bubbles, and the Volcker Rule ,” On the Economy blog, December 10, 2013, http://jaredbernsteinblog.com. 26. Ben S. Bernanke, “ The Great Moderation ,” Address to the Eastern Economic Association, February 20, 2004, http://federalreserve.gov; Thomas I. Palley, From Financial Crisis to Stagnation (Cambridge: Cambridge University Press, 2012), 132–33, 195. 27. Foster and McChesney, The Endless Crisis , 4. 28. Foster and Magdoff, The Great Financial Crisis , 99. 29.關於金融膨脹，見Jan Toporowski, Why the World Economy Needs a Financial Crisis and Other Critical Essays on Finance and Financial Economics (London: Anthem Press, 2010), 43–61. 30. Fred Magdoff and John Bellamy Foster, “ The Plight of the US Working Class,” Monthly Review vol. 65, no. 8 (January 2014): 1–22. 31.據我們所知，用來描述經濟長期放緩的“大停滯”這個術語，是由麻省理工學院的經濟學家萊斯特·瑟羅首次使用的，見Lester C. Thurow, “The Great Stagnation,” New York Times Magazine , October 17, 1982.雖然瑟羅指出了傳統觀點長期以來都未能考察停滯之可能性，但瑟羅自己（除了一些非常含混的凱恩斯主義理念之外）並沒有為停滯現象提供出一個理論解釋，也沒有追溯關於長期停滯的早期理論。相反，馬格多夫和斯威齊從馬克思主義的觀點出發，已然指出了“70年代[代表著]大停滯十年的開始”的現實；並且他們還指出，歷史表明通過瑟羅所鼓吹的單純的凱恩斯主義刺激方案，是不可能克服停滯的。見Harry Magdoff and Paul M. Sweezy, “Listen, Keynesians! ,” Monthly Review 34, no. 8 (January 1983): 1–11.馬格多夫和斯威齊那篇文章裡認為，比起用赤字開支刺激經濟,私人債務的巨大擴張更重要，然而後者不可能使經濟擺脫根本難題。最近，“大停滯”這個術語在大衰退之後變得非常流行，因為泰勒·考恩以和瑟羅相似的方式用了這個術語，見Tyler Cowen, The Great Stagnation (London: Penguin, 2011). 32.產能利用率在壟斷資本主義條件下的投資決策中的所發揮的作用，可見Josef Steindl, Maturity and Stagnation in American Capitalism (New York: Monthly Review Press, 1976) , 10–11, 127–37.並參見Foster, The Theory of Monopoly Capitalism , 107–27. 33. Richard Rubin, “ Cash Abroad Rises $206 Billion as Apple to IBM Avoid Tax,” Bloomberg News , March 12, 2014, http://bloomberg.com. See also Juan Sánchez and Emircan Yurdagul, “ Why Are Corporations Sitting on So Much Cash? ,” Federal Reserve Board of New York, Regional Economist , January 2013, http://stlouisfed.org , and “ Huge Cash Pile Puts Recovery in the Hands of the Few,” Financial Times , January 21, 2014, http ://ft.com. 34. Justin Lahart, “ The Next Problem: Too Much Profit ,” Wall Street Journal , March 28, 2014, http://stream.wsj.com/. 36. Cardiff Garcia, “ Birinyi: authorised US share buyback amount finished 2013 up 58% ,” January 14, 2014) Financial Times , Alphaville blog, http://ftalphaville.ft.com. 37. 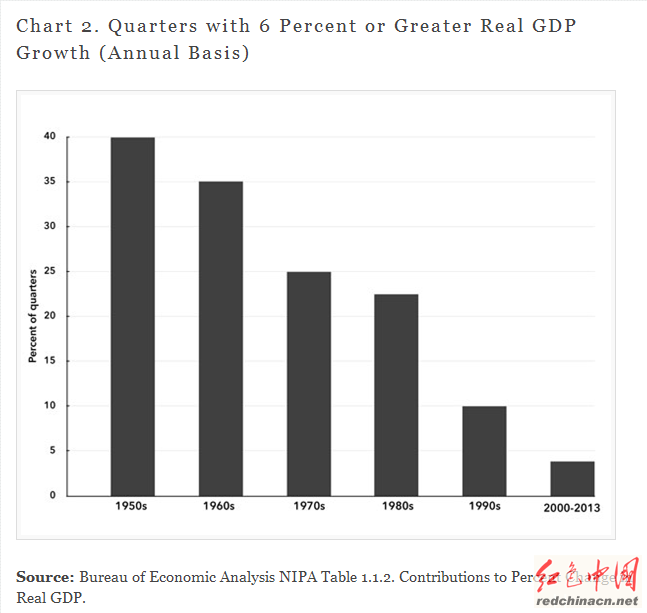 Bureau of Economic Analysis NIPA Table 5.2.5. Gross and Net Domestic Investment by Major Type; Harold G. Vatter and John F. Walker, The Inevitability of Government Spending (New York: Columbia University Press, 1990), 6–22 . 38.折舊基金和投資見Baran and Sweezy, Monopoly Capital , 99–104; Vatter and Walker, The Inevitability of Government Spending , 6–8, 113. 39. Ezra Klein, “ Larry Summers on Why the Economy Is Broken—And How to Fix It ,” Washington Post blog, January 14, 2014, http://washingtonpost.com/blogs. 40. Cowen, The Great Stagnation , 49–50. 41. “ Apple's 2013 Annual Report ,” October 30, 2013, http://macrumors.com; Google Investor Relations, “ Google Inc. Announces Third Quarter 2013 Results ,” October 17, 2013, https://investor.google. com; “ Facebook Will Grow Headcount Quickly in 2013 ,” January 30, 2013, http://techcrunch.com. 43. Aki Ito, “ Your Job Taught to Machines Puts Half US Work at Risk ,” Bloomberg, March 12, 2014, http://bloomberg.com. 45.見Robert Pollin, et. al, Green Recovery: A Program to Create Green Jobs and Start Building a Low-Carbon Economy , Center for American Progress, September 2008, http://peri.umass.edu/green_recovery. 46. ​​John Maynard Keynes, The General Theory of Employment, Interest and Money (London: Macmillan, 1973), 376. 47. Foster and McChesney, The Endless Crisis , 137-43; Samir Amin, Three Essays on Marx's Value Theory (New York: Monthly Review Press, 2013), 67–76. 48.米哈爾·卡列斯基對此作了有力的論證，見Michał Kalecki, The Last Transformation of Capitalism (New York: Monthly Review Press, 1972), 75–83.又見Paul Krugman, End This Depression Now! (New York: WW Norton, 2012), 94–96;以及John Bellamy Foster, “ Marx, Kalecki, and Socialist Strategy ,” Monthly Review 64, no. 11 (April 2012): 8–12. 49. Joan Robinson, “Review of RF Harrod, The Trade Cycle ,” Economic Journal 46, no. 184 (December 1936): 691–93. 50. István Mészáros, Beyond Capital (New York: Monthly Review Press, 1995), 893. 52. Thomas Piketty, Capital in the Twenty-First Century (Cambridge, MA: Harvard University Press, 2014), 7–11, 336, 515–17. 53. Michał Kalecki, Selected Essays on the Dynamics of the Capitalist Economy (Cambridge: Cambridge University Press, 1971), 35–42.對卡列斯基之財富稅和壟斷積累論證的討論，見Foster, The Theory of Monopoly Capitalism (New York: Monthly Review Press, 1986), 133–36. 54. Piketty, Capital in the Twenty-First Century , 471-92, 531-32. 55. Magdoff and Sweezy, Stagnation and the Financial Explosion , 88–90. 56. Paul Le Blanc and Michael D. Yates, A Freedom Budget for All Americans (New York: Monthly Review Press, 2013), 224–25. 57. Le Blanc and Yates, A Freedom Budget for All Americans , 232-33; Linda Bilmes and Joseph Stiglitz, The Three Trillion Dollar War: The True Cost of the Iraq Conflict (New York: WW Norton, 2008). 58. Arnold J. Toynbee, A Study of History , vol. 1 (Abridgement of Volumes I-VI) (Oxford: Oxford University Press, 1946), 11–13, 375-79. 59.見Fred Magdoff and John Bellamy Foster, What Every Environmentalist Needs to Know About Capitalism (New York: Monthly Review Press, 2011), 37–60.